We’d love your help. 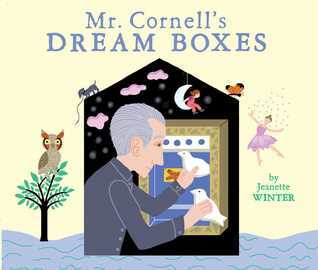 Let us know what’s wrong with this preview of Mr. Cornell's Dream Boxes by Jeanette Winter. Children young and old will delight in the artistic splendor of this illustrated nonfiction tale from the author of Henri's Scissors, which Booklist called an "exemplary picture-book biography." 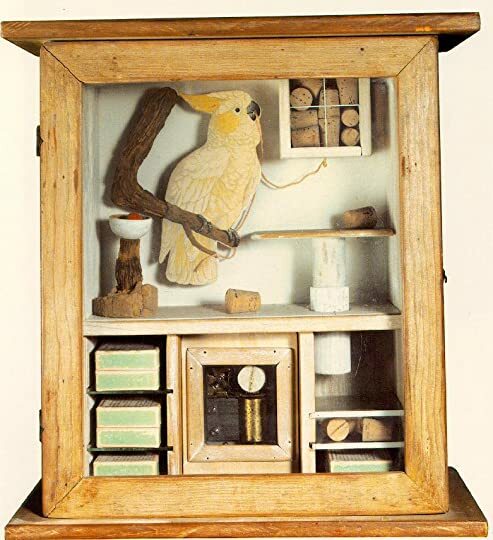 Joseph Cornell loved to draw and paint and collect things. With these drawings and paintings and collected treasures, he made marvelous shadowboxes--wonderlands covered in glass. An Children young and old will delight in the artistic splendor of this illustrated nonfiction tale from the author of Henri's Scissors, which Booklist called an "exemplary picture-book biography." Joseph Cornell loved to draw and paint and collect things. With these drawings and paintings and collected treasures, he made marvelous shadowboxes--wonderlands covered in glass. And who did he most like to share them with? Children, of course. For they noticed all the details and took in all the magic Mr. Cornell had created. To ask other readers questions about Mr. Cornell's Dream Boxes, please sign up. Fine, but I suspect useless -- Cornell's work is fairly accessible to children, and probably in its real detail more interesting to them than these simplified drawings. I don't see this book as particularly helpful as an introduction to Cornell's boxes, if one were needed, which I don't think it is. The illustrations aren't very reminiscent of Cornell's art, so the book isn't even useful for gauging whether your kid will like Cornell. Just show them some photos of the actual art pieces. I was ind Fine, but I suspect useless -- Cornell's work is fairly accessible to children, and probably in its real detail more interesting to them than these simplified drawings. I don't see this book as particularly helpful as an introduction to Cornell's boxes, if one were needed, which I don't think it is. The illustrations aren't very reminiscent of Cornell's art, so the book isn't even useful for gauging whether your kid will like Cornell. Just show them some photos of the actual art pieces. I was indifferent to the contrived frame of some random kid peering in at Cornell (seriously, kid, where are your manners?). It's wonderful to see one of my favorite artist getting the attention he deserves and to be able to introduce my children to his work. I love books that inspire children to be creative by using found or collected things. Wonderful, true story. With only two books about Joseph Cornell geared towards children - this one and "The Amazing Collection of Joey Cornell" - this one certainly seems aimed at a younger audience. But the story itself isn't especially engaging, and as many have said, quite boring. His life, and interest in arts and bits of things, love of sweets, love of film, massive collections, are so much more interesting than this! I wasn't in love with the newest book, either, but it is far more engaging and probably more int With only two books about Joseph Cornell geared towards children - this one and "The Amazing Collection of Joey Cornell" - this one certainly seems aimed at a younger audience. But the story itself isn't especially engaging, and as many have said, quite boring. His life, and interest in arts and bits of things, love of sweets, love of film, massive collections, are so much more interesting than this! I wasn't in love with the newest book, either, but it is far more engaging and probably more interesting for young readers than this one. While I appreciate Jeanette Winter's introduction to Joseph Cornell and his "dream boxes", this book was written and illustrated at such a introductory level that it would quickly bore many children and their parents. The failure to show Cornell's actual artwork leaves the reader hopelessly uneducated about the artist. It would have been so easy to layer this book such that readers of all levels would have found something of interest. I've always loved Cornell's boxes. There is something so idiosyncratic about them, lonely but touching. This is a nice introduction that children can easily understand. There is a nice little history presented in this book. The framing device works quite well. It's just the artwork was not to my taste. A brilliant little picture book about a fascinating outsider artist. Jeanette Winter fans like me probably aren't giving unbiased reviews... but this is great! Brief Book Summary: This book talks about the interests of Joseph Cornell, who built small, dream boxes of things he remembered. The book talks directly to the reader, and it explained what Mr. Cornell might do when he’s not making his dream boxes and that he really likes sweets. Response to Two Professional Reviews: I really agree with this first review that the book shows a lot of great illustrations, but none that truly capture the detail in Mr. Cornell’s dream boxes. I also agree that I’d like to see more detail in the artwork than in the viewers at the end of the story. Some real-life pictures would be very helpful. Evaluation of Literary Elements: The story of Cornell is told in a very fun way, that even young children can understand. Instead of only adding factual information, Winter tells the story as if it’s happening to the reader. The picture detail is great, but not when showing Cornell’s actual work. I like that other background information was added in the story other than what kind of artwork he did or what it looked like. Opening line/sentence: If you had lived on Utopia Parkway not so long ago, you might have walked past this house. Brief Book Summary: This book explores the self taught artist Joseph Cornell. In the book it shows some of his work, which was mainly wooden boxes that showed 3D images in them. Children had an interest in his boxes so Jeanette Winter tried to portray that through making this a children's book. Response to Two Professional Reviews: I enjoyed how the second review incorporates how Cornell was a twentieth century artist. The first one gives a background of the book, but I like how the second one focus's more specifically on Joseph Cornell. Evaluation of Literary Elements: I liked how on each page Winter had a small set of words portraying a specific picture on the page. It was neat to see how those words were scattered throughout the page rather than in a regular format like most books are. I also liked how she had some words bigger than the others and some smaller. Consideration of Instructional Application: After reading this book to the class I would have the students create their own 3D boxes. We could use cardboard boxes rather than wood, and the students could create any scene they wanted to within these boxes. I just want to create a program around this book. It's great! Written as a tribute to the real Mr. Cornell, Jeanette Winter takes her readers on a trip of discovery to meet a man that left a lifelong impression on her. 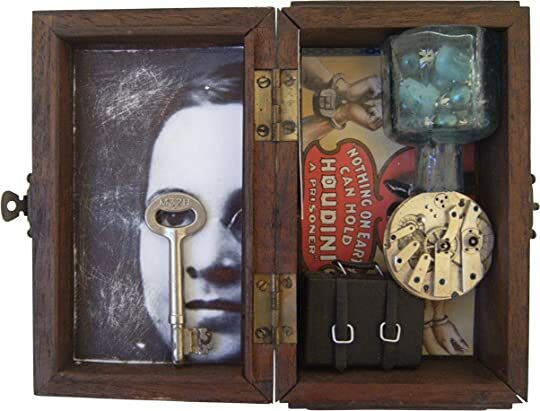 When Joseph Cornell was not crisscrossing New York City selling textiles, he was caring for his mother and brother; but in his free time, Mr. Cornell could be found in his basement, making memory boxes from random items that he found as he traveled throughout the city. Items that reminded him of adventures during his life. Mr. Cornell was a Written as a tribute to the real Mr. Cornell, Jeanette Winter takes her readers on a trip of discovery to meet a man that left a lifelong impression on her. Mr. Cornell was a quiet man that kept to himself, he saw mostly dreams and memories that he placed in his shadow boxes to share with children and in doing so, he also shared his love of art with those that lived on Utopia Parkway and beyond. When I found this book at the library, I immediately checked it out. Joseph Cornell is one of my favorite artists to study! In the past, I've created a few of my own shadow boxes with him as my inspiration. Jeanette's portrayal of Cornell's life was very sweet. I especially liked how Cornell's whimsical dream boxes were uniquely recreated using her own imagination and creative style. In my opinion, this non-fiction biography would be a treat for children ages 4-8 years (Preschool-3rd grade). It is written in a way that invites YOU, as the reader, to learn more about Cornell and how he created his interesting little "wonderlands." I would suggest using this picture book to introduce Joseph Cornell and his legacy. It's a fun way to explore how Cornell unexpectedly developed a passion for art and discovered a refreshing new way to interpret the world around us. Winter presents a fascinating look at Joseph Cornell, a Queens, New York resident, who created art using found objects. A picture book bio about a man who made beautiful shadow box artwork and immensely enjoyed sharing his gifts with children. I like the simple way in which readers are presented with the way in which Mr. Cornell created his imaginary worlds and readers are asked to decide whether he was an artist, a toy maker, a magician, all three? Back matter includes an author's note with pictures of Joseph Cornell and his last exhibition. Great read aloud for PreK-2 and one that begs for an extension activity in A picture book bio about a man who made beautiful shadow box artwork and immensely enjoyed sharing his gifts with children. 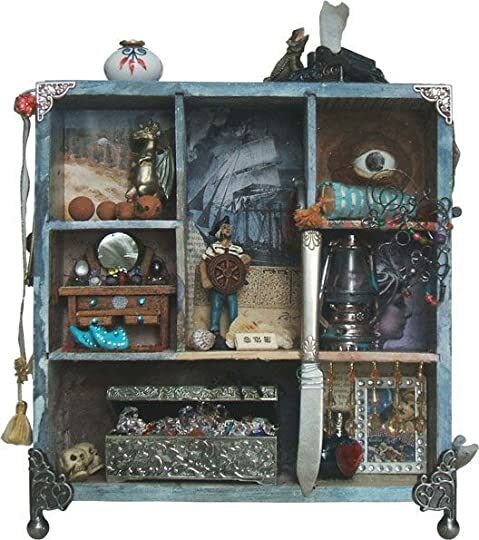 This would be great to share with students who may be creating their own shadow boxes, as well as those who like to collect seemingly random objects. It provides inspiration to create as well as keep a journal. The introduction to Joseph Cornell seems secondary. White background gives emphasis to each of Mr. Cornell's dreams and bold, bright yet simple illustration of each event described. Large black text is easy to read. The book is about an artist who made shadow boxes. Written in a very simple style, it still uses sentence patterns that might provide good patterns for students writing about a person or a nonfiction topic: he remembered. . . . if the light in the ___ was (off/on), you might have seen. . . .
A sweet and simple introduction to the assemblage artist Joseph Cornell and his "dream boxes." My favorite part is the show for children. "In 1972, the last exhibition Cornell attended before his death was held especially for children...The boxes were hung three feet from the ground--child height." Jeanette Winter delivers another fascinating biography. I really enjoyed the way she approached the storytelling aspect of it- as looking in more closely to the everyday life of Joseph Cornell the same way one would his creations! Another great book from Jeannette Winter, this one covering the life of a relatively obscure artist who created shadow boxes. I liked it a lot and it's simple enough that I could share it with any audience and they couldd probably enjoy it. Well done. We enjoyed this, though I did feel that it could have been a bit more detailed/informative. Also I wish it had more actual photos of some of his works. But it was nicely done and inspired us to do more internet research - so it served its purpose! 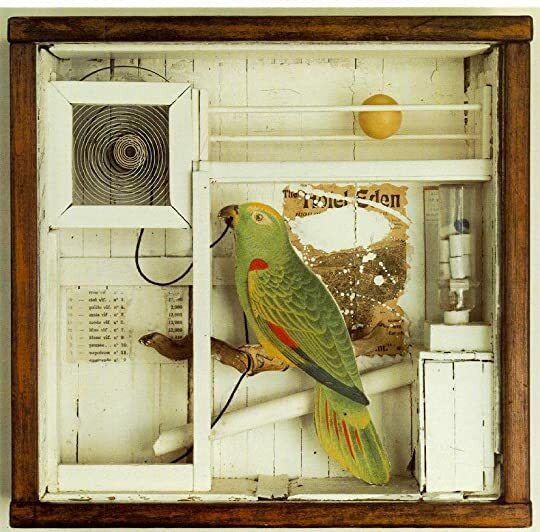 Joseph Cornell was a NY man who collected interesting objects and created shadow boxes with them. This is a dreamy, simple, picture book introducing us to his work and luring us to dream and create on our own. Would be a perfect art class tie-in. I enjoyed the fact that this book represents a different kind of artistry and creativity. This type of art and collecting may appeal to many young readers. The Author's note pulls in some important information. I would love to know more. I would have liked seeing the real photos of his dream boxes. The students had a hard time visualizing them from the illustrations. I read it to grade 4 students. Lovely tribute to a shadow box artist who lived in Queens, New York. I feel like the only redeeming qualities of this book are its illustrations and the author's note at the end which provides information about Mr.Cornell, who is in fact not a fictitious character.